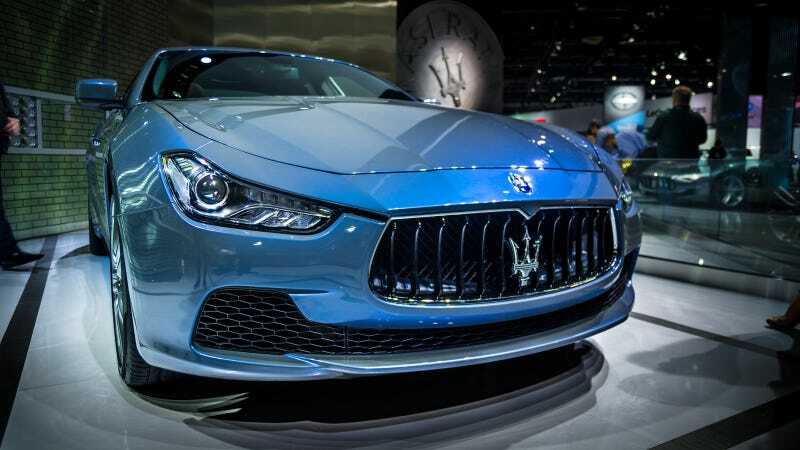 What, exactly, differentiates the Ghibli Ermenegildo Zegna Concept from the standard Maserati Ghibli S Q4 at first glance? Paint. It has Azzurro Astro paint "fashioned exclusively with Zegna" and made with aluminum pigments. It's as nice as paint gets. The triple layer of pigment includes the aforementioned aluminum as well as iridescent highlights of blue and ash grey, highlighting the character lines of the Ghibli. On the inside we're told there are some Zegna-inspired touches, but there's glass around the car and an Alfa Romeo 33 Stradale around the Zegna so I'd rather get busted trying to sneak into that. It's also hilarious they call this a concept since there's nothing about it they can't produce and it would be sort of a waste not to make the car now that you've already designed the paint. Think of it as a sort of an Eddie Bauer edition for moderately successful pornographers.